The Town of Carefree is pleased to again host the Chanukah Menorah Lighting as a part of its “Christmas in Carefree” holiday celebrations. 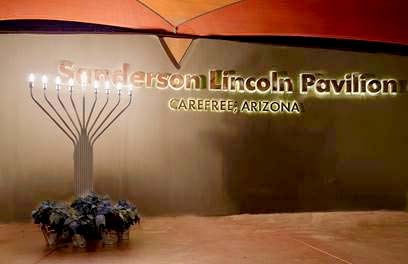 Congregants from Temple Chai, as well as members of the Jewish Social Group of Cave Creek and Carefree will participate in the lighting every evening in the Sanderson Lincoln Pavilion, 101 Easy St., beginning Sunday, Dec. 2 through Sunday, Dec. 9, at 5:30 p.m. The lighting each evening will be led by a different community group or family, with special Chanukah bags gifted to the first children to arrive each night. After lighting the menorah on Tuesday, Dec. 4, Rabbi Sarah Grafstein from the Spirit of the Desert congregation will host a drumming circle led by master drummer Daniel Hirtz. No prior drumming experience is necessary to participate, and attendees are encouraged to bring a drum of their own, with extra instruments available. On Sunday, Dec. 9, Temple Chai Rabbi, Cantor and Choir will be leading the event, with Lara Bistro donating potato latkes and dips to accompany the festivities for the last evening. Each lighting is open to attendees of all denominations and faiths. If you are interested in participating as host for an evening, please contact Vicki Zimmerman at Vicki @carefree.org/480-488-3686, or Karen Acker at karen@katopaz.com/914.980.7005. For more information, visit www.ChristmasinCarefree.com.